Cardolite offers a variety of cardanol grades that can be used as building blocks in high performance specialty chemicals. Cardanol is a versatile molecule that can be functionalized in many different ways on the phenolic OH, aromatic ring and double bonds of the long aliphatic side chain. Some examples of derivatives from cardanol include epoxy and polyol resins, surfactants, amines as curing agents, benzoxazines, and phenolic and polyester resins among others. Cardanol is a safer, non-toxic replacement for nonyl phenol and similar petro-based phenols. Cardanol is the main component distilled from Cashew Nutshell Liquid (CNSL), a bio-renewable and non-food chain phenolic resin extracted from the honeycomb of the cashew nut. 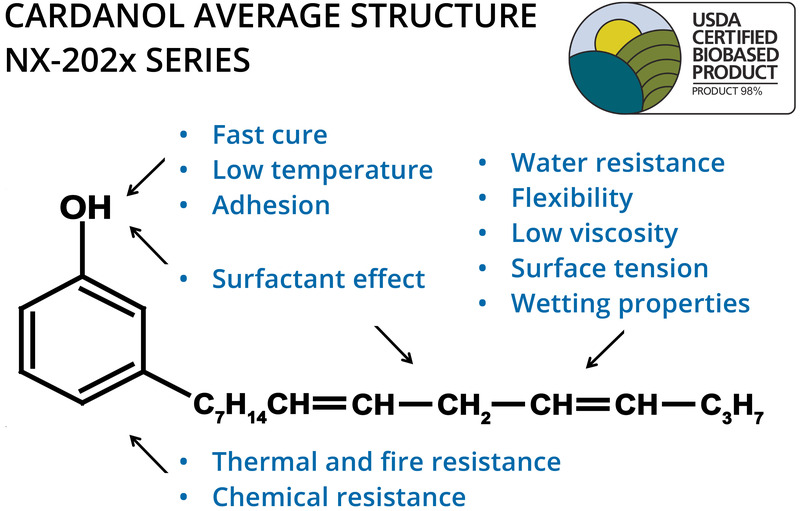 For years, cardanol and its derivatives have been successfully used in the coatings, adhesives, and friction industries due to their unique properties. In the recent past, the increased concern over the toxicity of nonyl phenol and a new proprietary process technology from Cardolite that produces cardanol with Gardner color one, have helped drive the adoption of cardanol in new applications that can benefit from its performance and safer nature. CNSL can be processed to yield different cardanol grades with a wide range of color, odor, and purity among other parameters. Recently, Cardolite developed a proprietary process technology that enables very high purity cardanol grades with ultra light color (Gardner of 1 or less) and good stability over shelf life. This leap forward in CNSL processing technology is expanding the use of cardanol as an intermediate and as an epoxy diluent and modifier. Cardanol is a suitable replacement for potentially toxic phenol diluents such as nonyl-phenol as it provides lower viscosity, better flexibility, and similar acceleration effects to epoxy-amine reactions. Please click on the link to learn more about the Ultra LITE technology. Cardanol is also available in its partially hydrogenated form called NC-510(HP). NC-510 is a waxy solid that has been used as an intermediate in color films and can be a versatile building block for other chemistries.